The T430 Series from Gyral Implements was developed from the TC Series of cultivators which was originally released in the late 1970's. 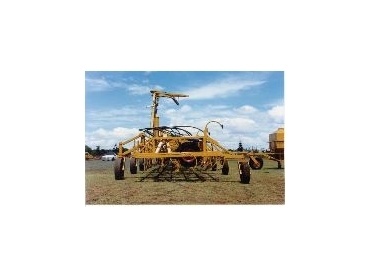 It is a broadacre non-fold secondary cultivator. The unique features of the T430 tilther include the wheel layout set within the hinged frame sections and the ball joint pull arrangement. These features allow each section to "float" and follow the contour of your ground. Either the 25mm Square 145lbf break-out tyne or the 30mm round 180lfb break-out tyne is available on this frame. The frame is made from 65mm square RHS beams and is designed to provide strength with economy in mind. The tynes are set over 6 beams to give excellent trash clearance and has an under frame clearance 485mm. End Tow option is available for road transport. Planting widths are 10.0m to 18.0m and come in 115mm, 125mm and 150mm tyne spacing.